"What did he eat last? Whom did he eat, in fact?" Lumbered with working alongside reptilian Chief Spy Anacrites, Falco has the perfect plan to make money - he will assist Vespasian in the Emperor's 'Great Census' of AD 73. His potential fee could finally allow him to join the middle ranks and be worthy of long-suffering Helena Justina. As above. This is no criticism of Gordon Griffin but he just does not have the right voice for the character he portrays. It weakens the narrative. Would you be willing to try another book from Lindsey Davis? Why or why not? Who might you have cast as narrator instead of Gordon Griffin? 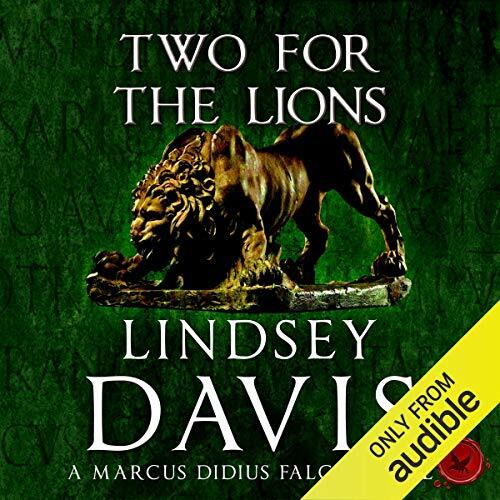 Was Two for the Lions worth the listening time? not another book destroyed by Gordon Griffin! I have this book in printed form and enjoyed it., so I ordered it via Audible. his reading of the book, with its old man voice, has totally destroyed it for me. because he also reads another 6 Lindsey Davis books, I have not bought any more and want to give this one back. please re issue with ANYONE ELSE reading the book! PLEASE!!!!!!!! There seemed to be a large section in the middle that was given over to background or scene setting. It just didn't move along at the usual pace. The start and finish were crisp but it got bogged down in the middle.